Learn how to outline. I hate to admit it, but outlining is one of those skills every writer needs. And I mean the classic outlining model with Roman numerals, capital and lowercase letters, and numerals. If you hate the idea of outlining, you are exactly the person who needs it most. Outlining as a means of note-taking helps us recognize the structure of the lecture or article, and it forces us to make judgments about the relative importance of concepts and their relationship to one another. Outlining as a pre-writing tool makes us organize our own thoughts before the first draft. 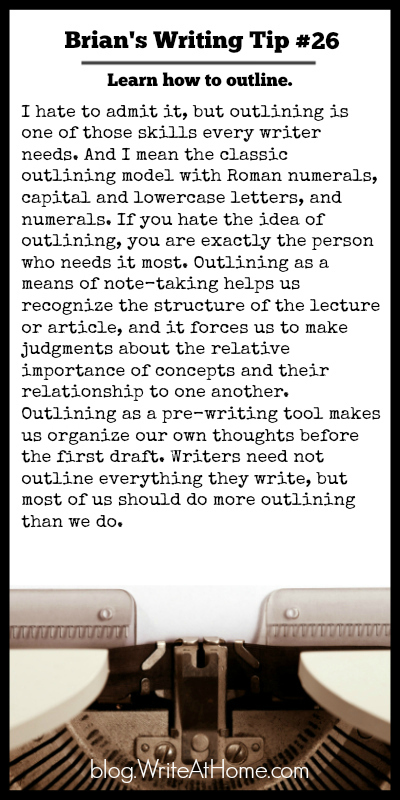 Writers need not outline everything they write, but most of us should do more outlining than we do. I look back at my past papers (the ones I wrote in public school) and ask myself how I ever wrote a paper without an outline. They are second nature for me now. Thanks for the post!